Sadly, as we age, all tissues and layers in the face change. The skin, the muscle, the fat and the bone all change. We lose the bony projection in the cheek bones, the fat pads shrink, the muscles shrink and weaken, and the skin becomes thinner and sags. The result is that we lose volume and the mid-face sags, this resulting in shadows, lines and a bottom-heavy face. Facial ageing is a complex and somewhat variable process. How you are going to age is, to an extent, in your genes. Other factors include your general health, sun exposure, whether you have been a smoker and whether you are over or under-weight. With a young face there tends to be little to no loss of facial volume, and so the patients tend to want to simply enhance their cheekbones for that contoured look achievable thus far only with makeup. Similar to “Facial Volume Loss”, we use dermal fillers to create that glamorous contoured look that so many which to achieve. You can expect no downtime from this, with instant results. Dermal fillers are injectable, sterile products which are based on our own ground-substance in our skin. Basically a form of sugar, they are responsible for the volumising or plumping effect in youthful skin. Cheeks fillers are safe, as long as appropriate, quality products are used and that they are injected by someone with appropriate training. Filler injections are medical procedures and a safe, hygienic technique is essential. With any procedure, there is a risk of some complications – this will be discussed at your consultation. Cheek fillers work by plumping the soft tissues including the skin and fat pads. Treatment will help restore any lost volume or give additional volume and contour, depending on the request or need. Can Cheek Fillers go Wrong? Any medical procedure can ‘go wrong’, but it is more likely to go wrong if the treatment isn’t done by the correct practitioner, to the correct patient, with the correct product in the correct way. Appropriate medical background and advanced training focuses on a high level of understanding of the underlying anatomy, safe preparation and injection technique. And of course the provision of aftercare and follow-up is also important in maximising the outcomes and satisfaction for the patient. How is non surgical cheek augmentation performed? The practitioner will discuss the best approach for any given individual. Treatment will vary for each individual and will even, in all likelihood, be different from one cheek to the other. Treatments, and cheeks, differ between males and females. Some practitioners will use a needle based technique, others a cannula (a blunt needle device), and others will advise using both. The essential point is the restoration or creation of volume in an aesthetically pleasing or beautiful way. We tend to advise that, as a rule, anyone over the age of 35 years will require at least 2ml of filler. Some younger patients may manage to see a difference with less, but effects can vary. As such, some patients may need additional treatment in the same area, or in the nearby ‘tear trough’ to maximise the benefit in the whole cheek area. Are there any side effects of having Cheek Fillers? A variety of side effects have been reported. They can usually be minimised by checking a full medical background. It is particularly important to avoid blood-thinners where possible (because of an increased risk of bruising), and the practitioner must not inject in any are where there is active acne or skin infection. Patients who get regular cold-sores must be given a prescription for anti-viral tablets. We explain to all patients that redness and puffiness will be present(A study confirmed that this happens in 97% of people). This will usually last a few hours but occasionally the puffiness or swelling can last for a couple of days. It is rare for it to last longer than that. Does having Cheek Fillers hurt? There is a small amount of discomfort associated with having cheek fillers. This will be discussed during the consultation and, on occasion, a numbing cream or injection may be offered. This is, however, not usually necessary. Most people describe an aching sensation and if this occurs, it may persist for up to a couple of days. It is very rare for people to be put off by the discomfort and the majority are keen to have further treatment when required. There will always be a medical assessment and discussion. If everything is suitable following assessment and discussion, a treatment MAY be carried out. A key point here is that the patient must be seeking treatment and understanding everything about the proposed treatment. If the medical practitioner and patient are not both in agreement about the proposed treatment, a ‘cooling off’ period will follow. This follows national guidance and is considered best practice. It all depends on the product used and the way it has been placed. Correctly placed product should give a natural and pleasing fullness. Of course this will also depend on the volume used. Results are visible immediately but tend to be best after a couple of days when any swelling and redness have gone. Correct placement of an appropriate product should, as noted above, give a natural result. Using a layering technique, some product should move in sync with the rest of the face. There have been examples of inappropriate products being inappropriately placed, which are then visible especially on smiling. We advise patients to expect a benefit for approximately a year. Some find that it can last up to 18 months but this is not consistent and does depend, to an extent on the product used. How will I know if I need Cheek Fillers? Have a look at an old photo – if you can see a crease or shadow form the inner part of the eye across to below the ear, you have lost significant volume in the cheek. Of course, more simply, if you are over 40 years then you have lost volume. It all depends on whether you are aware of this change and are seeking to improve it by restoring volume. Will people be able to see if I’ve had Cheek Fillers? If you seek a natural volume recovery, your practitioner will work with you to try to create that. People are more likely to say that you look well, or fresh than think you’ve had cheek fillers. Of course it’s up to you whether you tell them. Is non surgical Cheek Augmentation the same as Cheek Fillers? There is an overlap here, but in fact other treatment options may also be used in addition to cheek fillers when we are performing non-surgical cheek augmentation. Non-surgical thread-lifts, radio-frequency, ultrasound or skin treatments may also be used. Who can have Cheek Augmentation with Dermal Fillers? Most people who have good general health can have cheek fillers. There are a few exclusion, like pregnant ladies, but this would be discussed as part of the medical consultation. Why are Cheek Fillers so popular? 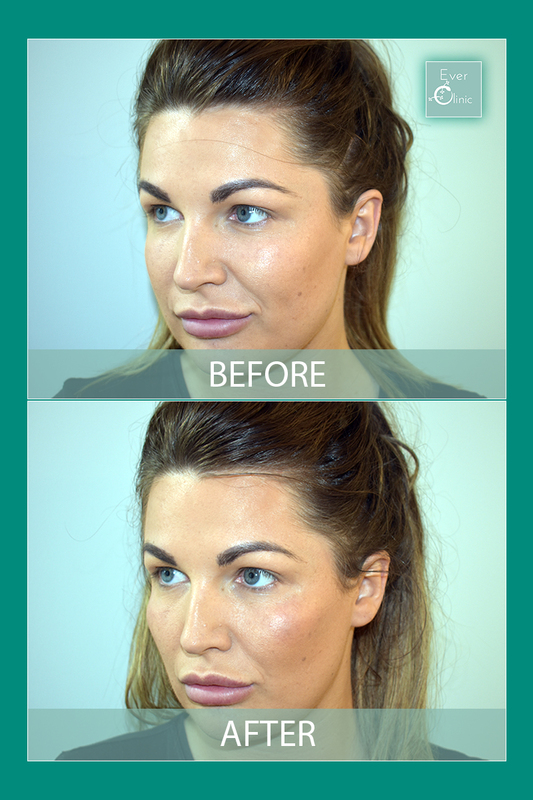 Cheek fillers help the cheeks and also the lower face. Nasolabial folds are actually best improved by restoring volume in the cheeks. There is a vogue to treat the jawline with fillers, but here the results will be maximised by first addressing the cheeks. Even in the ‘tear-trough‘ area, treating the cheeks first will give a better overall result. Cheek fillers are temporary or at best semi-permanent. It is actually not recommended to use the older style ‘permanent’ fillers as these are associated with significant difficulties if any complications arise. Are there any treatments that I should consider having at the same time? We’ve tried to include the answers to this in the above sections and as you have read, there are areas that can be addressed together. Ultimately this is a very individual thing and as such is best led by your treating clinician at Ever Clinic who will advise of the best options for you.